Yesterday I was having a conversation with an out-of-state blogging friend I’ve never met in person and we were talking about what it might be like if we lived in the same neighborhood and could hang out over a cup of tea. A lovely thought. And then yesterday I discovered Weekend Coffee Share, a weekly feature over at Part Time Monster’s blog. I’m certainly not one to resist such a fortuitous invitation. If we were having coffee, we’d likely start our visit out on the front porch where you could test out those new comfy cushions I got for the chairs and you could enjoy the wafting scent from the nearby lilacs. I might take you around back for a quick tour and show you my enormous and delightful bleeding hearts, but we wouldn’t stay long. The air is literally saturated with moisture and the promised thunderstorms seem very nearby indeed. So I’ll head us inside and take you up to my tiny little studio where we can talk and I can show you some things I’ve been working on. If we were having coffee I’d tell you how finally this week it’s beginning to feel like I’m moving into my spring/summer creative rhythm. And how I love having a whole slew of projects to work on that I can wander amongst as I’m inspired. Like these three journals. I do an under-a-minute sketch each day, which is the journal on top. I’ve been doing this for quite a while now, and now I’m thinking I’ll start adding words to the project. I’m thinking maybe a one-sentence story or a found poem – just a bit of a writing challenge practice each day. I’m also on this huge gluing/pasting kick at the moment – it’s the call of sticky fingers. The bottom journal is quick magazine tear-out compositions in response to prompts. I love this kind of project because I’m very good at trusting my intuition. I don’t overthink, I simply go with my first reactions. And then later, it’s really fun to look at the compositions and see the not-so-obvious. It’s like discovering a delicious secret clue I’ve left for myself. The middle journal is a collection of b&w printed images of various pieces of art I own. Now I’m going back and adding color to the pages – adding layers, either emphasizing something from the original or juxtaposing something entirely different onto the images. This is another process I really enjoy, and I credit it for helping me hone my ability to make connections. While we were sipping our coffee, I’d remind you that tonight is the new moon, and ask if you had any plans to celebrate it. It can be a powerful time to set an intention for the lunar cycle and make wishes as well. I’ll certainly be doing both, and given that I’m really enjoying cutting-and-pasting at the moment, I think I’ll do a dreamboard as well. The new moon doesn’t arrive until 11:15 this evening in my time zone, so I think I’ll have a fabulous late night in the studio. 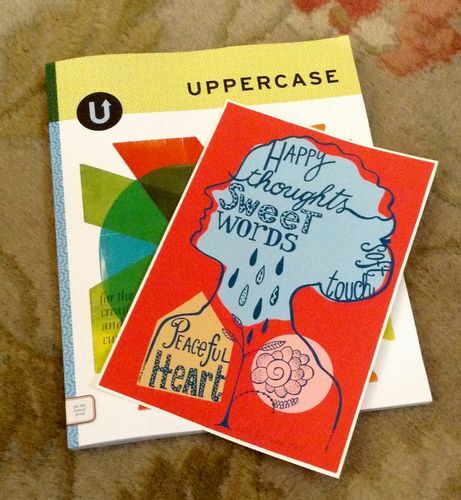 I’d also tell you that I’m hoping to spend some time this afternoon devouring the latest issue of Uppercase. I love this magazine. There’s always so much to savor. And this is the printmaking issue which I’m especially looking forward to reading. With this issue, subscribers received a bonus tucked into their mag – a randomly selected print submitted by printmakers across the world. I’m over-the-moon delighted to have received this beauty from Kate Brennan Hall. I love her work! And just as Kate’s work says, if we were having coffee, I’d wish you happy thoughts, sweet words, soft touch, and a peaceful heart. What about you? What would you tell me about if we were having coffee? Have a new moon wish? A journal project you’re loving? Do tell – you know I love to hear. What lovely journals—and what a lovely print! I think I need to start creating some art or something crafty again. It’s been a while, and I rather miss the process. Glad to have you with us this weekend! I’m a self-professed java junkie and so I’m enjoying the opportunity to stop by and have so many coffees. 🙂 Wishing you a wonderful week, and the opportunity to incorporate some arting/crafting into it. And thanks for stopping by – I appreciate it. Thank you for the coffee. I’d love to see more of your sketches, as someone with very minimal drawing skills I love seeing what other people do. I think my new moon wish would be for the big change I’ve just made to work out well, and to get my book finished and off to the editor. (am I allowed two?) Hope you have a wonderful week. What wonderful wishes Rosie. And yes, indeed you can have two wishes. The more the merrier I say. Wishing you a wonderful week as well, and thanks for stopping by. Well, I’d be having tea or chai, or maybe lemonade given the weather. I’d probably talk about my project to read a bunch of aviation adventure books. Thank you for the coffee, Deborah, and the moments on your porch with the lilacs. Your studio is delightful and I particularly enjoyed seeing your journals. I’m looking forward to the new moon. The timing is perfect – I’ve gone off FB for 3 months, beginning tonight. I’m excited to see what that brings. Oh I feel the spaciousness of that decision Linda – what a perfect gift to give yourself. I’m most interested in hearing how it goes for you, so I hope you’ll share. Thanks Deborah for the coffee – hopefully another cup as well? Loved getting a glimpse into your life. Thanks for reminder about new moon – I was wondering last night when she was due. I’ll look tonight and set an intention – I’m hopeful the new moon will be the launch needed. May you have a blessed and peaceful week. 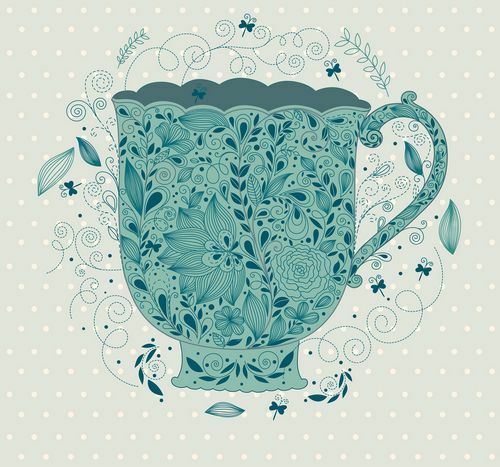 Always another cup Susan – it’s an ever-refilling pot. Hope your wish arrives with perfect ease, grace, and speed. And wishing you a wonderful week as well. Thank you for the coffee and the beautiful scent of lilacs. It’s one of my most favorite fragrances of spring. I also set some intentions for the new moon. I released old patterns that were no longer serving me. It was part of a Red Tent workshop ceremony. I love your journals and like the idea of combining images with words. How wonderful to be part of a Red Tent ceremony. and a perfect time to do some releasing. Wishing you a wonderful week. If we were having coffee I hope we’d share about how this inspired blogging group and the SoulSpace group on FB have been changing our lives and how they both have pointed us back to our creative outlets. I’d be happy to see your journals and maybe show you my dollies. And I think we’d have a great time. It would be fun to have you over for coffee. We’d go for a walk to the southwest corner of our property so I could show you my little baby lilacs. I am gleaming from ear to ear that they are budding. I planted 24 of them in that area so the southwest winds will blow their wonderful fragrance right to the house. 🙂 And if we were at your place I think I’d feel compelled to take a picture of your beautiful bleeding hearts for sure. One of my must have favs for early spring blossoms in the garden. Oh Kelli – a wall of lilacs! I’m truly swooning. I can only imagine how wonderful that will be. I like thinking of it as cracking the door open, letting the Muses know I’m open for business this morning. Oh my gosh. You are making me cry, you dear dear woman. This is so sweet. Well, if we were having coffee at your place I would insist that you show me all your fascinating little projects that you are working on and I would slowly work my way through those art journals. Since we would be meeting on the new moon, I would probably read to you from The Lunar Tao – a book which follows the lunar traditions of the Chinese culture. And most assuredly I would wish for us to spend at least SOME of our time exchanging either Tarot or I Ching readings, as these are always fun too. If we loads of time, we could perhaps work on some art together. This is one of my favorite things to do with friends. If you were visiting me, I would show you my new cushions that I also got this summer and we would certainly sit out on the deck for a bit and enjoy my pansies and my newly planted veggies and herbs. I would want to show you all my art stash (and see yours when I visit you) and show you my latest knitting projects and my new cactus garden. I would also want to make you some really good coffee and give it to you in a favorite cup. I have to say Amy this all sounds perfectly wonderful! What fun. What a lovely time I had walking through this experience! Although I have to warn you if I had been there in person, I would be ‘slowly’ perusing your artwork, your journals, and even your lilacs. I love to really spend time ‘in the moment’ enjoying every little bit of what’s going on around me. I can practically smell the lilacs as I type this. Thank you! That’s a wonderful way to be in the world Elda – fully present and drinking it all in. Lovely! If we were having coffee, Deborah, I’d so love to be spending time with you! I’d have tea or water as I’ve never acquired the taste for coffee. 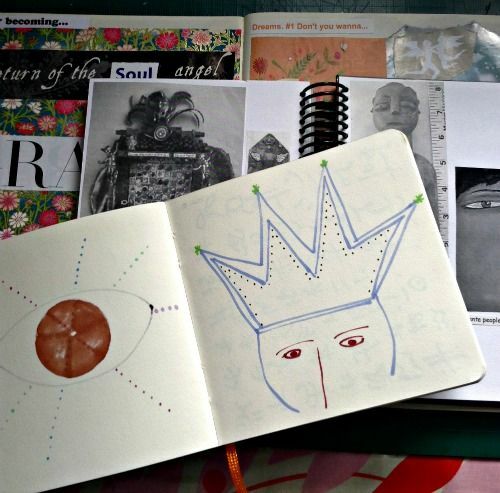 I love seeing your journals, and am particularly intrigued by your black and white photos of the art you own. And I connect with you on being friends with my intuition. And lilacs and bleeding hearts, all wonderful! Let’s do it again, soon! Indeed let’s do it again Janet. And I’ve got quite a stash of wonderful teas for you to try. Vanilla Orchid is a current favorite. What a lovely blog post. I have seen this elsewhere. Wonder if it is linked to you or another group. While this was my first time playing, apparently this hop has been happening for quite some time. A lot of coffee has been shared. 🙂 Thanks for stopping by and saying hello. ah … you’ve reminded me of Uppercase magazine! thank you. I am gifting myself some subscriptions ( have you seen flow magazine? http://www.flowmagazine.com/) I am going to add that one to my list. I’ve been absent, away, making my way through. There are still some changes and adjustments happening in my life right now. One important one that I am making for myself is connecting in the way that feels good and right to me. This means a slower, intentional time of reading, conversing in comments … I miss the pre-facebook days. I am going to reclaim that for myself. You have always been a light and wonderful example of making connections. Thank you for that. It feels good to be back. Oh thank you for the hedz up about Flow! I remember discovering them some time ago before they starting accepting international orders and was disappointed I couldn’t get my hands on what seemed so delicious. But then I forget, so I’m really happy for the reminder. And isn’t Flow such a perfect name for a creative endeavor?! Yes, yes, yes to right-fit connecting! So glad you’re making your way back Cynthia!